Inventory We are a resale marketplace, not a box office or venue. Ticket prices may exceed face value. This site is not owned by Ford Center . The Ford Center Evansville is the new state of the art facility that is replacing Roberts Municipal Stadium. The Ford Center box office can provide a seating capacity of up to 11,000. The arena is set to open November 9th 2011 with a performance by Bob Seger and the Silver Bullet Band. The total construction cost for the Ford Center is approximately $127 million. The arena will be home to the University of Evansville men and women's NCAA basketball teams. 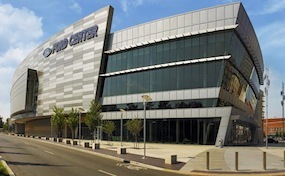 Ford Center tickets will play host to many upcoming concerts, hockey, and basketball contests. CenterEvansville.com is not currently affiliated with any primary box office, venue, or official website. We are proudly independently owned and operated focusing solely on all online events in the secondary ticket market. Prices can fluctuate above and below face value and can change rapidly with demand. To purchase tickets to all Ford Center in Evansville events simply follow the easy to navigate steps online through the checkout or pick up the phone and call our operators at anytime.